Things got competitive but we think they're all rock stars! The Weekend TODAY team went rock climbing yesterday — and while we have to wait a few weeks to watch the full segment, we have a behind-the-scenes glimpse into the Friday night adventure. Sheinelle Jones took to Instagram to share a series of photos of Peter Alexander, Dylan Dreyer, and herself scaling the indoor walls, and they all look like they had an amazing time. The Weekend TODAY co-host posted a short video compilation of pictures set to upbeat music. "Friday outing with the Weekend TODAY crew," the video begins in bold capital letters before cutting to solo shots of Sheinelle, Peter, and Dylan mid-climb. There are also some group shots of everyone posing together once they were all safely on the ground. They're all sporting enormous grins in all of the photos. 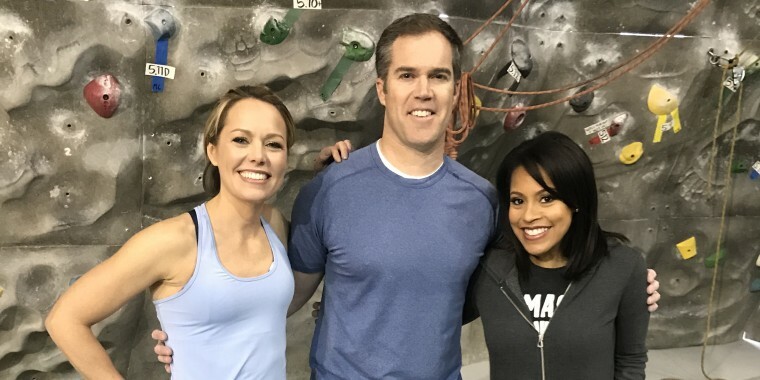 "#rockclimbing field trip w/ weekend @todayshow crew - @peteralexandertv @dylandreyernbc & rockstar producer @vanwinklehannah (produced by Kayin)," Jones captioned the video. Weekend TODAY fans are loving the sneak peek. "Look at you crazy kids," Ellen Katz wrote. "You never rest. Just having so much fun." "You guys are The. Best," Kelley Kitley commented. We also have some intel on how the rock climbing adventure went. According to producer Hannah Van Winkle, "The three of them had a blast." She also teased that there was some friendly competition, and that the winner just might surprise viewers. Stay tuned, weekend watchers! All will be revealed in a few weeks.